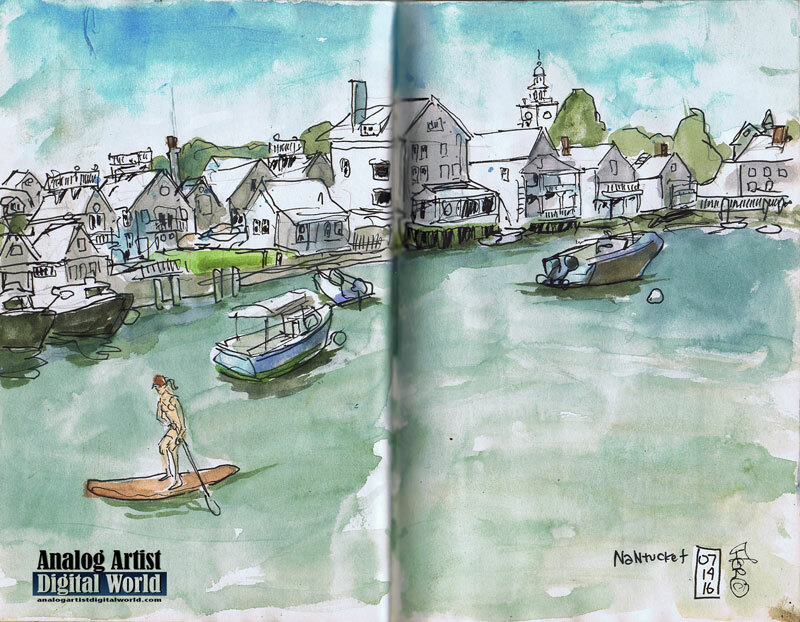 I explored Nantucket island at random with my sketches.I remembered that when I got off the ferry there was a wonderful view of downtown. I sat on a piling and started to sketch. I worker quickly and as I did this woman made her way up the channel on her paddle board. It was such a peaceful scene of everyday life in Nantucket. Far in the distance was the steeple of the Nantucket Historical Museum. I was up in that steeple later in the day, and the view of all of downtown with all it's grey historical homes was spectacular. I wondered if FloYo had made its way to Nantucket. FloYo is yoga practiced on paddle boards. Sketching a whole class doing the downward facing dog on their paddle boards would be a fun challenge to sketch. The parking lot behind me filled up as another ferry disgorged a boat load of tourists. There was gridlock for a while as everyone tried to drive out onto the island. Then things quieted down again. I got a Nantucket baseball cap downtown so I wasn't squinting into the sun every time I sketched. It was a classy tan hat that I have since lost. I seem to leave a pencil, eraser or hat just about everywhere I go. I am trying to Velcro my latest hat to my art bag every time I take it off. That hat makes me look like an Iowa farmer, or hunter.